UPDATE, 9:00a.m. : Without discussion, Senator Lindsey Graham announced that a Senate Judiciary Committee vote on Liburdi's nomination - along with a few others - was being postponed for one week. He noted it was "at the request of our Democratic colleagues." 5:30a.m. : The Senate Judiciary Committee is expected to vote this morning to recommend President Trump's nomination of Michael Liburdi to become the newest U.S. District Court Judge in Arizona. Liburdi was Governor Doug Ducey's General Counsel for the past three years. As reported by Arizona's Politics, Liburdi applied for the lifetime appointment directly to the Trump Administration, as opposed to being recommended by Arizona's Senators. The vote on his nomination will follow that of a more controversial nomination, of Neomi Rao, for the DC Circuit Court of Appeals. Live video of the Committee's meeting, beginning at 8am (AZ Time) can be found here. Assuming a positive vote in the Republican-controlled committee, his nomination will then be forwarded for a vote in the entire Senate. The timing for that is uncertain. At the beginning of the clip below, you can see staff putting up a "liar, liar, pants on fire" poster. Rep. Gosar read the poster aloud near the end of the questioning. Yesterday, Gosar published an editorial column on The Hill's website. BREAKING: Omnibus Natural Resources bill - containing 7 land exchanges and one National Heritage Area in Arizona - passes House 363-62. Senate passed it 92-8, heads to @POTUS. @SenMcSallyAZ shepherded AZ measures in Senate. As Chair of the Natural Resources Committee, Arizona's @RepRaulGrijalva controlled the Democrats' debate time on the floor of the House this afternoon, and called the omnibus "a win for conservation for the country." Arizona Rep. Ann Kirkpatrick is one of a handful of Democrats who did not co-sponsor the resolution to reverse President Trump's declaration of a national emergency to build a border wall. Kirkpatrick - who was near the border during the week - previously compared Trump's emergency declaration to the boy who cried wolf. She has not yet responded to Arizona's Politics' request for comment on why she failed to sign on. Here is the one-sentence text of the resolution terminating the national emergency. There reportedly are several Republicans in the Senate who will also support the resolution. However, it is not certain whether either house would have the necessary votes to override the promised Presidential veto. Passed last year and signed into law by President Trump on August 13, the John McCain National Defense Authorization Act required the Defense Department to report to Congress by October 12, 2018 on the known and suspected nuclear capabilities of North Korea. According to the three relevant House Committee Chairs today, that report has not been received, even though the President is summiting (with) Kim Jong Un next week in Vietnam. Additionally, it seems like an appropriate moment to note that the Trump Administration has never attempted to fill the Special Envoy position tasked with "North Korea human rights issues". This new @HouseOversight report re: Administration efforts to end run and sell Saudis nuclear reactors shows the most swampiness of swamps in the DrainTheSwamp crowd! 1) Read the report here. It contains a very well-organized timeline of the too-lucrative-to-kill plan. 2) Pro Publica actually reported on much of this last year, including how it was coming back to life. The new information is how this Saudi/nuke plan has been secretly accelerated in light of the Kashoggi murder and the swell of opinion to sanction the Saudis. 3) Back in the transition and early days of the Administration, Derek Harvey, Trump's Senior Director for the Mideast on the National Security Council, was pushing for the nuclear reactors to the Saudis deal for General Michael Flynn and Tom Barrack. Flynn had been receiving money from the IP3 company that was proposing to be the seller, and Barrack was interested in investing in Westinghouse to make money off of the proposed deal. 4) After Flynn was out of the NSC, Harvey continued pushing and worked with Rick Gates (then working for Barrack) and claimed to be working it so that Jared Kushner could push the plan through with Trump. 5) Harvey was eventually removed from the NSC. Guess where he ended up? Working for Rep. Devin Nunes on the House Intelligence Committee. 6) Arizona Rep. Paul Gosar (R-CD4) sits on the House Oversight Committee. Arizona's Politics is seeking his reaction to this report and will update as necessary. 8:10pm: BREAKING: All 4 AZ GOP Reps. vote against spending bill compromise. @RepRaulGrijalva only AZ Dem to vote against. 19 Dems, 109 Republicans voted no. GOP breakdown, 87-109. Dem breakdown, 213-19. Here are a few of the pages of the 1,169 bill that Congress is voting on today to keep the government funded past tomorrow and provide $1.375B for border barriers. These are the pages specific to the border wall funding that President Trump was insisting on. It restricts the barriers to steel bollards and other designs previously approved. It restricts it to the Rio Grande Valley Sector of the U.S.-Mexico border, rules out some sensitive areas and gives border towns a say in what happens within their jurisdictions. The bill passed the Senate this afternoon, 83-16, and is slated to be voted on in the House tonight. Both Arizona Senators voted "aye" and at least two House members (Biggs, Gosar) have indicated that they oppose the agreement. Senate Majority Leader Mitch McConnell stated this afternoon that the President will sign the measure and will concurrently declare a national emergency in a controversial effort to free up other funds for more border wall. 11:38am: Arizona Senator Kyrsten Sinema joined two other Democrats and all Republicans in confirming William Barr to become the new Attorney General this afternoon. The final vote was 54-45. Mike Liburdi will have his hearing in front of the Senate Judiciary Committee tomorrow morning. Liburdi was nominated last month by Presdient Donald Trump to fill one of the two judicial vacancies on Arizona's U.S. District Court bench. Liburdi was Governor Doug Ducey's General Counsel between 2015-2018. He applied for the lifetime appointment in August of last year by going directly to the Department of Justice. In 2016-17, he had not been considered by a judicial selection committee that had been set up by Arizona's two Senators. Typically, the Senators recommend individuals to the Administration for such nominations in their home states - particularly when the Senators and the President are of the same party. For example, the other pending judicial nomination from Arizona was vetted and recommended by McCain and Flake in early 2017. Hon. Bridget Bade's nomination for a position on the 9th Circuit Court of Appeals was approved by the Senate Judiciary Committee last week on a remarkably bipartisan vote of 17-5. Her nomination is now ready to be voted on by the entire Senate. The differing pathways for the Bade and Liburdi nominations was set forth in their written submissions to the Committee, and lays bare some of the tension that existed between Trump, McCain and Flake. Bade is an uncontroversial pick both because of her judicial experience as a U.S. Magistrate Judge and her lack of political involvement. Liburdi will be more controversial because of his political experience, including his role as the Chairman of Arizona's Right To Life PAC. His hearing is scheduled to begin at 8am, Arizona Time, and he is on the second panel of nominees. The proceedings can be viewed here. Well, we're trying something new here, that will hopefully serve a couple of purposes. Co-founder Paul Weich spends a couple of hours a week volunteering at Sun Sounds of Arizona, which is a statewide nonprofit reading service for people who have difficulty holding and/or reading print material because of a disability. It is part of the KJZZ/KBAQ/Spot 127 nonprofit operation operated by Rio Salado College and the Maricopa Community Colleges. In addition to filling in and reading the Arizona Republic, Wall Street Journal and various magazines, Paul records the Phoenix New Times (which is never boring) each week. Most of the articles would not be appropriate to post here, but some of the award-winning reporting meshes well with Arizona's Politics. The two-part series published last month is among the latter, and inaugurates this new feature. "Border Cowboys" delves into what is going on down on the Cochise County portion of the U.S./Mexico border, and how the heck billionaire Howard Buffett fits into the vigilante history there. Throw in the Sheriff's Offices in Cochise County and a couple of Illinois operations and conservation districts, and you have an article that must be heard (or, read) to be believed. The Fund for Investigative Journalism, Arizona Center for Investigative Reporting, and the Center for Media and Democracy contributed financial support to this reporting. And, those are all worthy of your support. However, the 2nd purpose of offering this article for listening/downloading is to raise awareness and funds for Sun Sounds of Arizona. If you know of someone who would benefit from listening to these newspapers, magazines and more, take a moment to let them know. And, since it is a member-supported nonprofit community service, take another moment and become a member. "A large factor contributing to this prolonged period of gestation was the impoverished state of the American news media. "Independent investigative journalism is in serious peril. Due to the weakened state of newsrooms and their budgets, there is a diminished appetite among publishers for potentially unflattering reporting pertaining to wealthy and influential interests. "As much as this particular story sits at the crossroads of so many issues weighing heavily on us in these times, it was rejected and dropped by a long string of publishers before it reached its final home with the Phoenix New Times. We should never take the existence of such publications-- willing to take on this kind of reporting-- for granted. "Simply put, the number of those in this profession who are able to "comfort the afflicted and afflict the comfortable" has been decimated, several times over, in the course of these past few decades (though, to be honest, I'm not sure it was ever our job to comfort anybody). "Do what you can to support investigative reporting. Support your local independent news outlets (if you have any). And-- wherever practicable-- seek out information yourself. Ask questions. Assert the truth-- especially amid a chorus of lies and misinformation." Mighty glad to see Willie Nelson on stage last night, pluckin' his guitar and belting out the lyrics as he's done for years. (Even if his mic wasn't turned up at first... in a room full of producers and engineers, no less.) He's joined in this video by Dave Matthews, his sons Micah and Lukas, and Lukas' bandmates (Promise of the Real). And this is not quite off-topic because of the lyrics - written by David Lynn Jones - for "Living In the PromiseLand", which are re-posted below. MOMENTS AGO: Arizona @RepDLesko is backing up @GOPLeader McCarthy on trying to interrupt House schedule to consider "Born Alive" anti-abortion measure. H.R.962 - To amend title 18, United States Code, to prohibit a health care practitioner from failing to exercise the proper degree of care in the case of a child who survives an abortion or attempted abortion. Lesko is not (yet) a co-sponsor of the measure, although Arizona's @RepGosar is. Only 3 of the 48 co-sponsors are female, so it appears @GOPLeader had to stretch to provide the all-female background. Basically, McCarthy asked that the measure introduced yesterday be brought immediately to a vote. The Chair noted that that would require unanimous approval from both parties' leadership and committee chairs. Arizona's Senators both voted to help pass the Senate's Mideast Bill Package this afternoon. S.1 passed by a 77-23 vote as Majority Leader Mitch McConnell's (R-KY) first legislative priority for this session - began while avoiding a vote on the then-shutdown; its future in the Democratic-controlled House is uncertain. While all of the Republican Senators but one (KY's Rand Paul) supported the measure, the Democrats were split, 25-22. 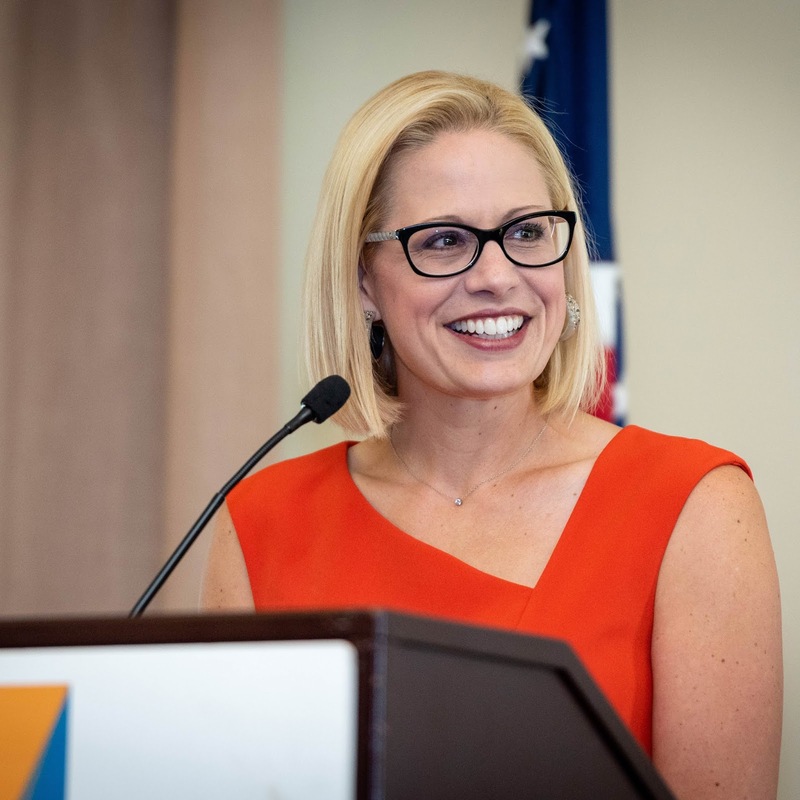 Martha McSally and Kyrsten Sinema have consistently voted in favor. Recent attention focused on the rebuke to the President's desires to withdraw most/all troops from Syria and Afghanistan, but that is not what divided the Democrats. Rather, it was the piece of the bill that gives support to state and local governments passing measures to thwart the BDS movement targeting Israel over its control over areas won in 1967. The American Civil Liberties Union and pro-Palestinian factions believe it targets their rights under the First Amendment. Arizona has had such an "anti-BDS" measure for the past three years, and is presently involved in a challenge in the 9th Circuit over its provisions. Arizona remains one of the last four states to have not conformed to the tax changes passed by Congress at the end of 2017. * Governor Doug Ducey today vetoed the measured passed by both houses earlier this week. Thread by @dougducey: "THREAD: Today I vetoed SB1143. What should have been a technical bill to conform Arizona’s tax code to the federal tax code developed into a […]"
*According to Politico, only four states had not conformed either the individual or corporate changes. Pinnacle West is no longer limiting its political contributions to obvious campaigns. A new filing reveals a December 31 $50,000 contribution to the association to elect Republican Attorneys General (aka RAGA). During the last campaign cycle, APS's parent company donated $150,000 to RAGA, which turned around and spent heavily to help re-elect Arizona AG Mark Brnovich. ($425,000 went from APS to RAGA in the 2014 campaign.) That significant amount of assistance raised eyebrows last year when the AG's office changed the ballot wording of Proposition 127 last autumn in a way that directly aided APS's opposition to the initiative. Ryan Anderson, the Communications Director for the Attorney General's Office, takes offense to the implications that the APS contributions to RAGA have any impact on Brnovich's actions. He tells Arizona's Politics that "It's ridiculous....to suggest that that was done at their (APS's) behest or to their benefit is sad and disappointing." Anderson notes that people look at the political scene and "assume the worst in everyone," but that that is not the kind of person Mark Brnovich is. Phoenix attorney Paul Weich contributed this article. He is also co-founder of Arizona's Politics. Arizona Senator Martha McSally may have "built the best compliance team in the country", but that team continues to struggle properly dealing with the volume of contributions that she received during (and after) her unsuccessful campaign to defeat Kyrsten Sinema for the retired Senator Jeff Flake's seat. Last week - before the notices were sent out - the McSally committee had filed an amended report correcting - re-attributing, re-designating or refunding - some of the monies. The Year-End report filed last night includes more corrections. However, that still leaves LOTS of contributions to clear up. Fortunately, she has more than $900,000 in the bank to pay her compliance people to clear up the problem. In addition to the excessive contributions and the occupation/employer info, the McSally campaign's filings reflect that it continued to pay campaign staff as independent contractors rather than as employees. Arizona's Politics reported on this issue before the election. In so doing, the campaign did not have to either withhold taxes or pay benefits to the workers. The McSally campaign was the only one of the nation's most competitive (read: expensive) campaigns to not have any "employees". Arizona's Politics has reached out for a response from the McSally team, and will update this article as warranted. *Candidates are allowed to collect monies for a recount, and those monies do NOT count against a contributor's limits for the primary and general elections. However, since a recount did not happen in this case, it is not clear how the campaign must treat those monies. FEC Press Officer Judith Ingram tells Arizona's Politics that the FEC analysts will be evaluating yesterday's year-end filing and may further advise. Phoenix election law attorney Paul Weich - also an Arizona's Politics' co-founder - contributed this article.